Guys guys guys! Guess what? Oh, you’re never gonna guess. *snickers* I’m so good at keeping secrets. McKenna: Uh, it’s in the title. Oh, right. Well, if you read the title (I know, titles are boring, you probably never read them), then you know today is my 1-year blogiversary! Yep, you read it right – it’s been a year already! I know, I can scarcely believe it myself. And, what’s even crazier is that I ALSO have 100 followers now! You guys are so, so awesome and I really appreciate all of your support. A big thanks to Elysium for being my very first follower! And thank you also Guyloup for being my 100th follower. My current tally is 102. Yes, I am doing a stereotypical blogiversary giveaway, BUT the items I am giving away are actually for humans and not for dolls. THIS IS A VERY SHORT GIVEAWAY. This is the most important rule – you MUST enter by Saturday, June 2 at 12 PM Alaska time/1 PM Pacific time. Because I will be buying the shirts from a store, I want to make sure there is still a good size selection so I can be sure to purchase your shirt in your size. Enter by leaving a comment below. You must be a follower of my blog to enter. (If you are a new follower, make sure you hit “confirm follow” in your email, or I won’t see that you followed. Share about this giveaway on your blog or Pinterest. Make sure to leave a link so I can see! Make sure you are commenting with a valid email. You must live in North America to enter, due to expensive shipping to/from AK. Step 2: If you are my first winner, I will email you and ask you for your shirt size and address. You will get first pick at the shirts. Step 3: If you are my second winner, I will send you an email as well. You will get the shirt the first winner did not pick. If you need more clarification, feel free to comment or email me at americangirlsak@gmail.com. Due to iPhone image quality, the colors did not turn out well . . . the pink is a bit more fluorescent (if that’s even possible) and the blue on the second shirt is more of a turquoise. Tell a friend about this giveaway! If they enter (and tell me you told them!) you can get an extra entry! If you have more than one blog, reblog this on your other blog. Please make sure in your comment to tell me which of these bonus entry methods you used. I think that about wraps this up. Thank you again for supporting me in my first year of blogging, everyone! I can’t believe it’s been a year already. You guys are fantastic! My Opinion on New AG Items! Hello, doll lovers! AHH THE WEEKEND IS ALMOST HERE, I CAN TASTE IT!!!!! Molly: How does one taste the weekend, AGs in Alaska? One who is suffering from schoolwork overload can taste it, Molly. Molly: That’s not a real condition, you know. For a twelve year old who is studying for her SATs, maybe not. Okay . . . yeah, she’s gone. Back to business! AG has released many new springtime items, and I am very excited to share with you what I think about them! First up is Maryellen’s Airstream® Travel Trailer! My grandparents have an Airsteam®, and my grandma was the one to tell about this new item. I think the colors are adorable, and I love how the outside is silver, just like a real Airstream®. Knowing AG you would think they would make it pink . . . but of course, it wouldn’t be a real Airstream® then, would it now? The couch cushion fabric is super cute, and the floor is very retro 50’s. The little designs like the curtains and cooking accessories are perfect, but I wish the clock looked less plasticky. The minifridge and oven look like part of the Our Generation kitchen set, though. If you watch the video on the AG website, you can see that the table folds up and the couch folds down to save space/make a bed, which is exactly like a real camper. The awning also rolls down, which is perfect. The lights in the trailer work as well, which is awesome. The trailer also comes with a button to make nine different camping sounds, which I think is hilarious. This next set is Maryellen’s Hiking Accessories. The brochure and campground guide are super adorable, and according to the AG website that lunchbox/camera thing is a 1950’s falashlight? Okay . . . it apparently glows, again, according to the AG site. It does not look super well-made, like it could easily break. The satchel seems to be of nice quality, but I don’t particularly care for the way it looks. That’s just a personal preference, though. Those are Maryellen’s new accessories, so now it’s Nanea’s turn. This first item is her shaved ice stand, obviously. I love the colors and THE AWNING IS ADORABLE. IT LOOKS SO REAL. The little chalkboard is a super cute touch and I also love the light on the side. The handle actually turns on the shaved ice machine, which is authentic to the 1940’s and is adorable. AND THE SCOOPER. THE SCOOPER IS AMAZING. I really like the syrup bottles too but the shaved ice looks ridiculously plasticky! The old AG quality is turning into something that looks like it’s from a cheaper brand. The cool thing about the cones is that AG dolls can hold them, though, so that’s neat. Nanea’s Birthday Accessories are pretty cool. I freaked out when I saw the doll-sized Nancy Drew book. It’s my favorite thing about this set. The pineapple skirt for Nanea’ dog Mele is amazing. The purse is interesting but looks like something from the 40’s, so . . . okay. Apparently Nanea’s and her friends are called “The Three Kittens,” so that’s why there are cats on it. The Kodak™ camera looks very cool, except that you can see it’s plastic. I love the black-and-white photos of Nanea and Mele that go with it. Not a whole lot to say about Nanea’s 1940’s radio, except that it looks incredibly plasticky. The cord looks real, though. Not a great product, in my opinion. This one is Maryellen’s Vacation Playsuit! I think the fabric and the style are adorable, except for the problem that the outfit is entirely too immodest. If the skirt part went down to her knees, it would be fine. The sandals are super cute, and the gingham handkerchief goes great with Ellie’s hair. Nanea’ Tropical Birthday Outfit is, needless to say, pineapple-y amazing. The sailor top is beautiful and the skirt is too much! It matches her eyes PERFECTLY. And the sandals are, again, amazing. I really love these new AG outfits. I’m not a huge fan on Nanea’s other outfits, but I really love this one. Like Maryellen’s new outfit, Nanea’s Palaka Outfit is too immodest. It would make a cute one-piece, maybe with a belt or bow at the waist instead? Love the sandals and the flower, though. There are a couple of new Truly Me outfits out too – this one is the Sunny Day Dress. I like the embroidery and cinched waist, as well as the sandals – but the headband doesn’t seem to really go with the outfit. I think it would be cute plain. It does match the sandals, though. I’m not really liking this outfit too much. The Explore the Outdoors Outfit is pretty cute. I love the jacket, very cute and good color. The shirt and skirt are nice, too, cool designs and color (the shorts could stand to be a bit longer). The sandals are okay. I prefer the outdoorsy outfit the Create Your Own dolls come with better. I don’t think AG did a very good job with these new Truly Me outfits. AHHHHHH A MOLLY MINI DOLL! Aside from the ridiculous cost of $24.99 for a teeny-tiny doll, she’s perfect. The outfit is adorable, and I assume this will be the one the 18-inch Molly will wear when she comes out. The glasses are perfect. She’s just so cute!!! Sorry, I’m a Molly fan, in case you couldn’t tell . . . Okay, that’s all for my opinions! What do you think of these new AG items? Which one is your favorite? Are you getting Molly when she returns to the AG collection? Do you like Maryellen’s or Nanea’s collection better? Let’s talk in the comments below! Today’s TDOC post is a winter lookbook. Not all of these looks are Christmas-themed, as I don’t have very many Christmas clothes. I would love it if you guys commented on which outfit you liked the most! First up, we have this lovely outfit Morgan is modeling! She is wearing McKenna’s school outfit, a sweat that I’ve had forever, and a headband I made! Here’s Emily! She’s wearing coveralls that came out of nowhere, the True Spirit AG meet outfit shirt, the Real Me AG meet outfit pants and shoes, and Emily’s Holiday Outfit necklace. Sorry the shoes aren’t showing. Molly is wearing her meet outfit skirt and shoes and Molly’s Holiday Outfit sweater. Lastly, Lindsey is wearing some random AG pants that totally don’t fit her, her meet necklace and meet sweater, and the shoes from an AG Easter outfit. Alright, that’s all for the outfits! Don’t forget to vote on which one you liked best in the comments! Countdown to Christmas: Seven days! Back to the giveaway. A quick thing you should know is that this dress is NOT BRAND-NEW. I bought it used off of Ebay with a few other outfits in a package. Since I already own this dress, I thought I would give this one away. It has been GENTLY USED, but it is not BRAND-NEW. The dress does not smell like smoke or even laundry soap. As you can tell from the picture, it’s still gorgeous. It’s also a retired outfit from American Girl, so that may bring some extra appeal. Of course, a few pictures for a giveaway quickly turned into a photoshoot. Please note that the necklace Emily is wearing will not be included in the giveaway. You must be 18 or older OR have a parent’s permission to enter the giveaway. You must live in North America. You must actually want to own this dress, and are not entering just to win something. You must reblog this on your blog. You must enter by Sunday, December 24th (Christmas Eve). I will randomly select and announce the winner on Monday, December 25th (Christmas Day). If you are not yet following my blog, make sure you click “confirm subscription” in your email after you click the follow button, or it won’t count. If you win, I will send you an email asking for your home address/P.O. Box. And guess what! There are a few ways to get a bonus entry! If you have a YouTube channel, create a video about this giveaway and post it. Tell a friend about this giveaway. If they agree to enter, you get an additional bonus entry. (Emphasis on “agree to enter.” If you tell a friend but they don’t enter, it doesn’t count.) Tell me what friend it was who entered, and make sure they put in their comment that you are the one who told them. To claim your bonus entries, simply comment in your original comment which ones you did, or post another one. Okay, that’s all for now! I hope you guys have a great day, and I’ll see you tomorrow! Countdown to Christmas: Nine days! Brrring! I blink my eyes and fumble around for my alarm clock. Seven in the morning is waaaaaaay to early for me to function. I head over to my closet and select a cute outfit. I pick out a cute pink shirt, a gray skirt, and pink leggings. Perfect! I can totally rock pink. After completing my morning beauty routine, I head to the living room to check my email before breakfast. “Morning, Crys!” Lindsey sings. I turn aroun and my mouth falls open. Lindsey is wearing Molly’s horendous (in her opinion, beautiful) red-white-and-blue tap dancing skirt as a strapless, sleeveless top, and Molly’s dress skirt on the bottom. Lindsey leaves me spechless and wondering what else is in the back of her closet when she leaves to let her dog outside. I return to my email, but I’m not left alone for long. McKenna and Emily tromp through the living room wearing . . .
Emily is decked out in pink pajama pants and a hot pink skirt. McKenna is sporting a beach towel wrapped around her with one of Grace’s Parisian scarves. McKenna and Emily leave and I log onto Kaylyn’s World Blog to check out her new post. As I laugh at Izzy’s antics, Grace walks by me. “I hope you’re going to change,” I say slowly. “Well, what you’re wearing is not exactly . . . fashionable,” I explain. Grace has on an old dress of our grandma’s over Morgan’s riding pants . . . which are inside-out. I close my eyes tightly, hoping Molly and Morgan enter wearing reasonable clothing. Molly is wearing a Lady Gaga-style trash bag, and Morgan is wearing a dress that would be pretty – if it weren’t paired with yellow-and-green PJ pants. Molly and Morgan turn on me. “Are you going to criticize our outfits, Crystal? Because if so, just put a sock in it. We’re tired of your fashion police attitude!” Molly exclaims. “Yeah! What do you know about fahsion anyway?” Morgan accuses me. I wake up panting. Oh my goodness. It was all a dream. I get dressed and head for the living room. “Hey, Molly,” I say. I hope everyone enjoyed that photostory! I’ve been planning it for a while. Also, sorry about some of the pictures. My camera kept taking them blurry, even though I thought they were clear when I checked. I’ll have to make sure it’s working properly. There is one contradiction between two of the photos. If you can find it, consider yourself a Little Miss Molly. Nothing gets by her. First off on the runway, we have this gorgeous glowing dress with a fashionable bow around the middle and sparkling sequins to light up the night. Next up is a more sporty style. The simple turquoise uniform is brought together with a feminine sparkly silver-and-purple headband to keep your lovely locks back while you’re on the field. If you’re looking for a fun playtime outfit that will still bring out your style, try this one on for size. The comfy star-spangled jeggings are a stylish wear and match the bright blue stars on the tee shirt. The look is completed with a beautiful purple scarf. If you’re looking to wear your heart on your sleeve – well, almost on your sleeve – this puppy is yours. All Frenchie fans will go nuts for this sweet one – and best of all, he’s machine washable, so when he goes to roll around in some dirt, you can stick him right in. And this one is just a backpack I designed. There were rhinestones at the bottom, but the AG website wouldn’t show them. I’ve seen lots of “Oh, Snap!” play-on-words, and this one just popped right into my head. I hope you enjoyed those! 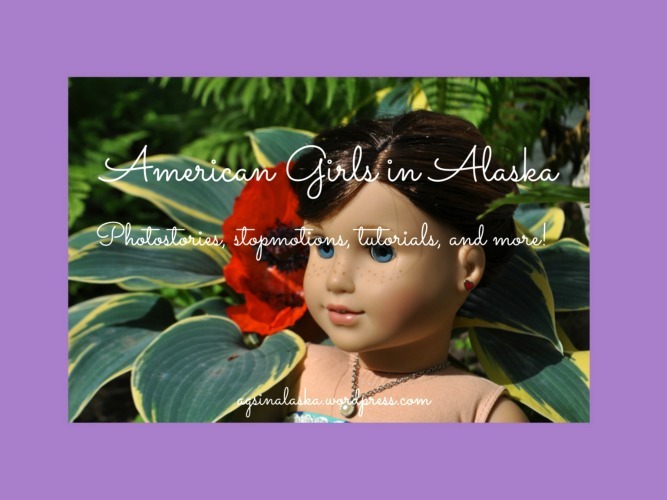 Go to the AG Create Your Own section of their website to make your own dolls and styles. Have a great weekend! I hope school is going good for y’all.